MikroCaps R&D Service | MikroCaps d.o.o. With more than 10 years of experience in encapsulation technologies and its wide range of R&D and production facilities, MikroCaps offers solutions from the initial concept to the manufacturing stage. 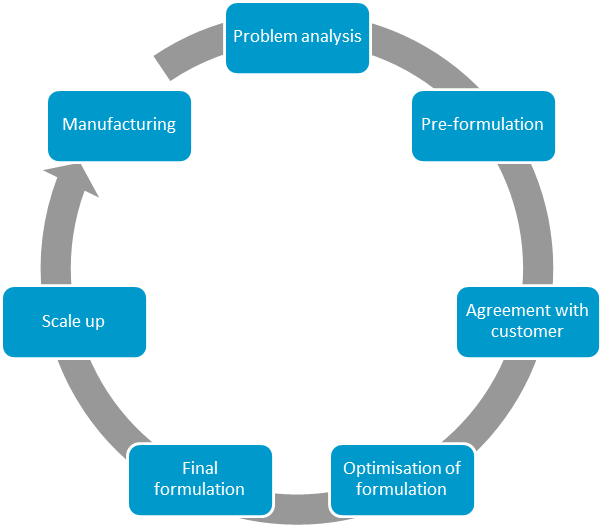 PROBLEM ANALYSIS: The first step in product development is problem analysis. After all the necessary information is gathered from a potential customer, an estimation is made of whether it is possible to encapsulate the active material or not. At this stage, economic aspects are considered as well. PRELIMINARY TRIALS: After it is proven that the project is technically and economically feasible, preliminary trials are conducted and the first sample/s for testing are sent to the customer. AGREEMENT WITH THE CUSTOMER: In case of positive testing results of the preliminary sample/s, the way of cooperation is agreed with the customer (signing of a cooperation or joint development agreement). OPTIMISATION: Based on partner feedback from testing the preliminary sample/s, the optimisation of the encapsulated material is performed. The final formulation is approved after all the testing by MikroCaps and the customer. SCALE-UP: When the optimisation is completed and the final product specification is defined, the scale-up stage follows. PRODUCTION: After the scale-up stage, the manufacturing stage starts (production by MikroCaps or providing basic engineering for process installation to the customer).